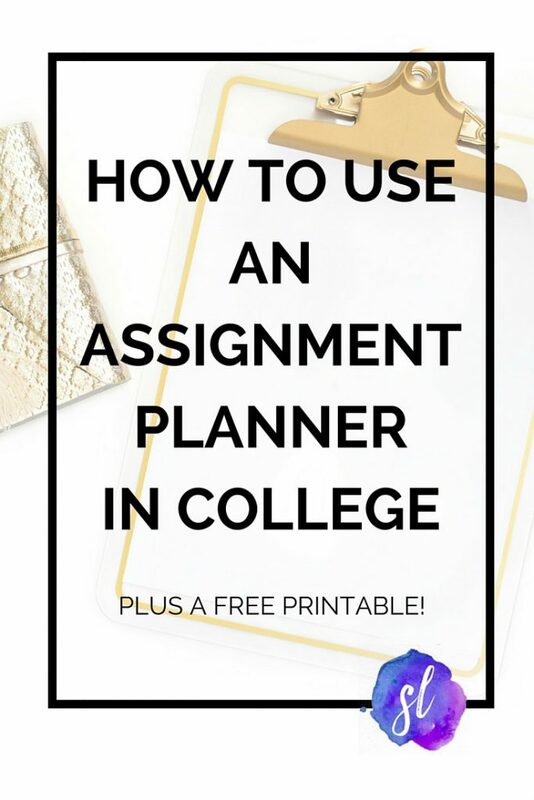 How to Use an Assignment Planner + a Free Printable! I’m of two minds when it comes to school assignments. On the one hand, I often find them imposing and scary, especially when their due dates loom ahead and I don’t yet have any ideas. On the other, once I get going, I love the freedom and intellectual exploration that a good prompt or assignment brings. Getting going is difficult, though! It can be hard to gather my thoughts and formulate them into a clear thesis or idea. Then, once I have the idea, it’s difficult to put it into action. 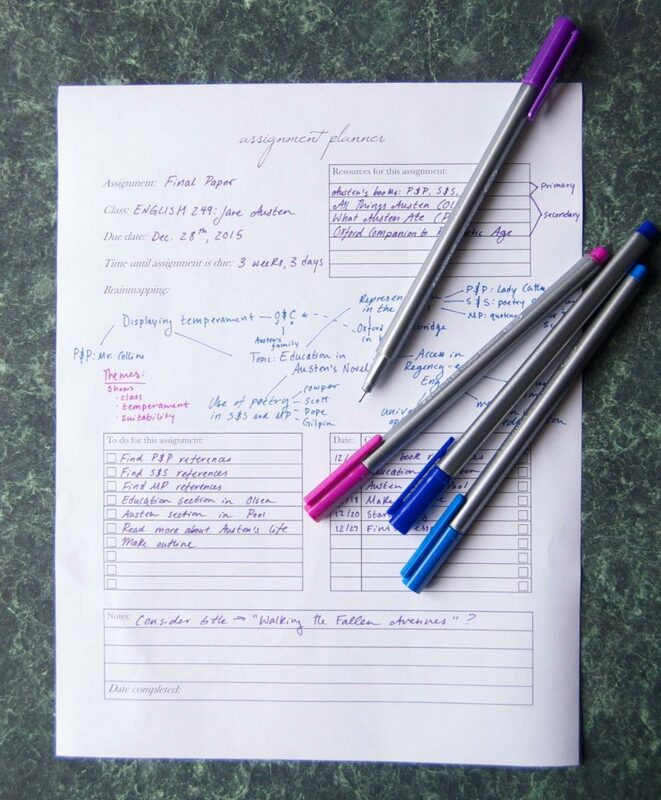 That’s why I’ve put together an assignment planning sheet, which helps me focus on what’s important about an assignment, lets me brainstorm and come up with a thesis, and formulates a timeline for the assignment. Best of all, I’m going to share it with you. Here is a free assignment planner printable, and how to use an assignment planner! The download link is at the bottom of this post. The first section is easiest; it’s just the basic information about the assignment and when it’s due. For the sake of this blog post, let’s say that I’m working on an essay for my English class, which is due in a little over 3 weeks. Next, I’ll make a list of my resources in the upper-right hand corner of the page. Examples of resources include primary sources (like the book you’re studying, or a historical text), secondary sources (commentaries, papers, journal articles, and books about what you’re studying), articles online, and class notes. For this paper, my resources include 3 primary sources (Pride and Prejudice, Sense and Sensibility, and Mansfield Park) and three secondary sources. Next up is brainstorming and mind mapping! For the printable, I refer to this joint process as “brainmapping,” which is actually the term for mapping out different regions of the human brain. Think of this as you brainstorming your ideas, and mapping those ideas out on paper to get a clearer idea of what they are. Here is the “brainmap” for our English paper. As you can see, I have my topic of interest in the center of the map. Springing from that, I have different “branches” of related topics or ideas. 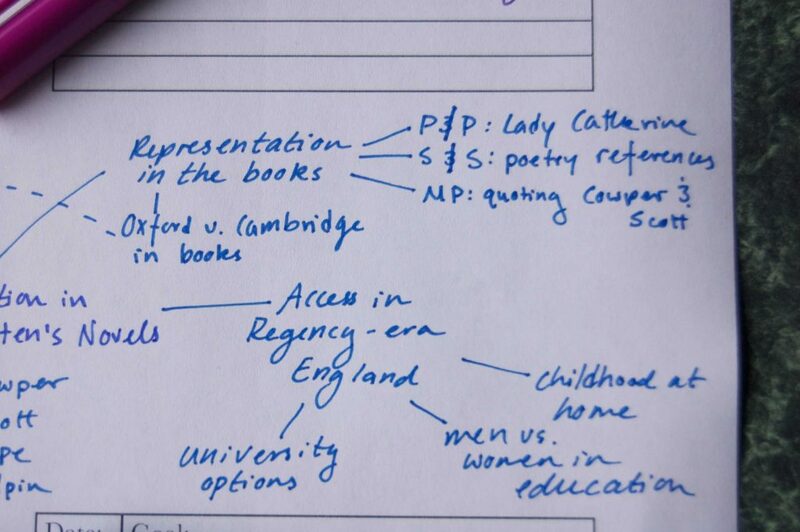 From my topic, “Education in Austen’s novels,” I mapped several branches. Above, you can see two of them. The first is how education is represented in the books; the second is access to education in Regency-era England. The first branch is thematic, the second is historical. That is totally fine! This is just a time for getting your thoughts onto paper. Now is a great time to make an outline of your essay, using the “brainmap” you made. I go over how to outline an essay in my eBook, which you can buy here (I also have a free guide to essay-writing here). 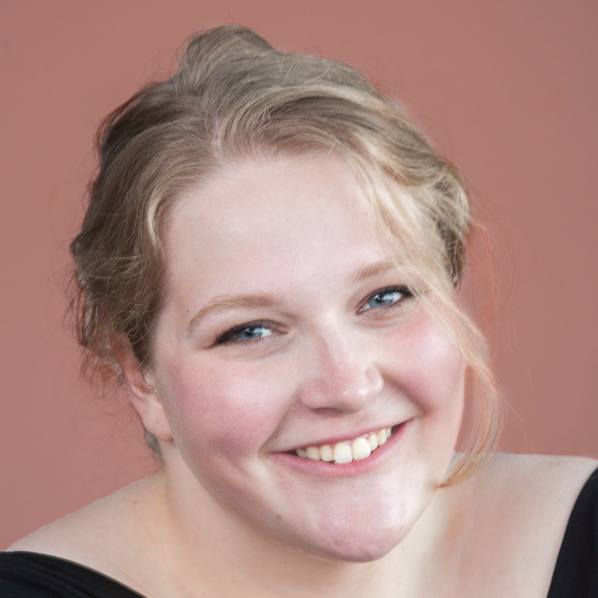 Because of that, and because your own project may not be an essay, I won’t go into outlining in this post. Next, we put together our to-do list and our schedule. The first thing we’ll do is make a list of to-dos for the assignment on the left. They can be in any order; just come up with all the steps you need to get from this planner to the finished assignment. Write them down in the chart. Now it’s time to put them in a schedule! This is incredibly important; most to do lists never get done because there is no timeline! Draft a timeline by writing down each of your to do’s in order. Now add a date in the left column of the chart. Make sure that you have enough time for each step, but also that you finish the assignment in time. The last part of the page is a notes section. This is just for miscellaneous thoughts, like brainstorming your title or writing down the exact points you need to include in your work. I also included a line at the bottom for the completion date of your assignment. And that’s it! 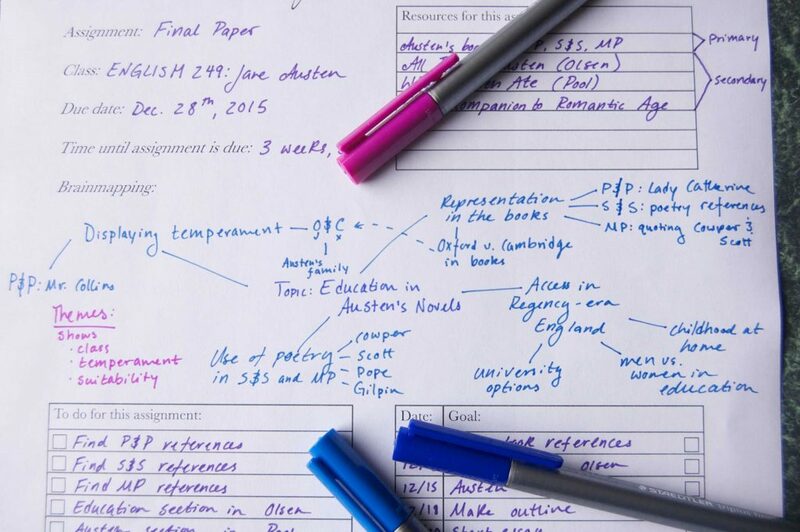 A free, easy, and complete way to plan your assignment. 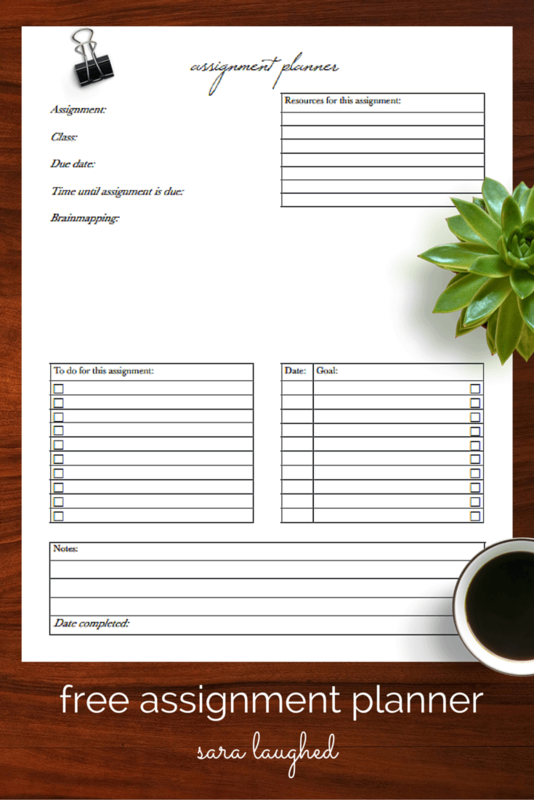 If you’d like to download the assignment planner printable, you can do so here: Sara Laughed Assignment Planner Printable. Here’s how it looks when you’re done. If you’re interested in more posts about college success, you can check out my guides to college organization, essay writing, academic success, planning for finals, and self-care. You can also check out my eBook, which is all about succeeding in college! I realllllly could have used this back in my college days. This is brilliant!! 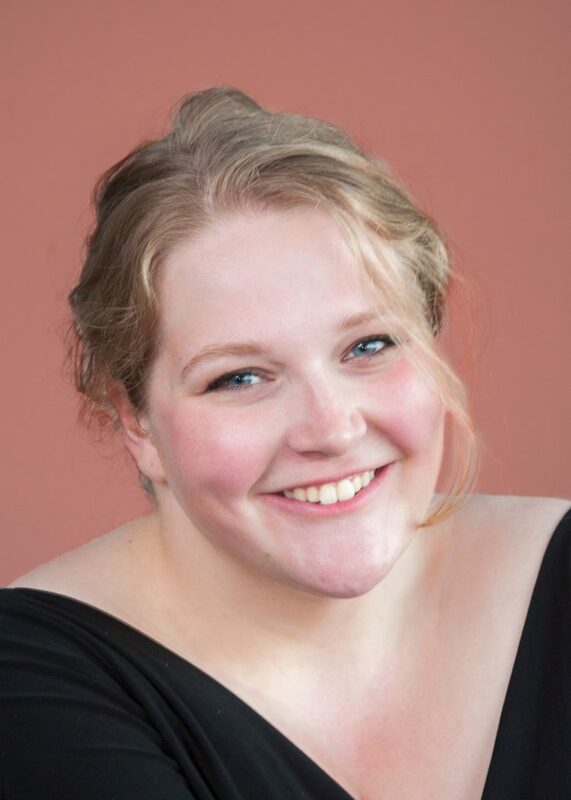 Thank you so much, Jenna! I really hope it helps people! I just used this for my class of high school students who have learning disabilities. They need a lot of help with organization and don’t know how to organize themselves. This will help with future projects in each of their classes.